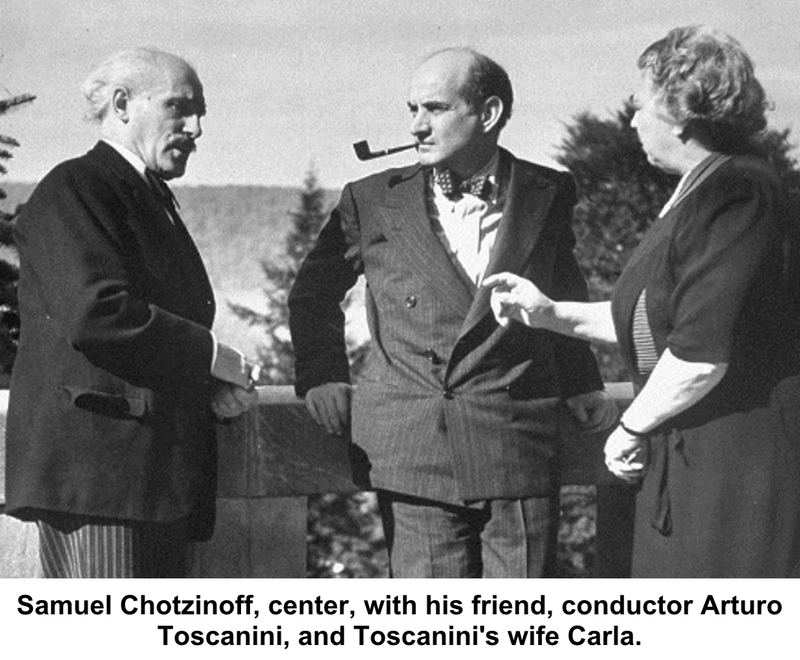 Arturo Toscanini, one of the leading conductors of the 20th Century, liked Ridgefield – and his friend Samuel Chotzinoff – enough to give concerts here in 1947 and 1949 to benefit the the Ridgefield Library (on whose board Chotzinoff served for 10 years) and the Ridgefield Boys Club. Chotzinoff, who lived on Spring Valley Road from 1935 to 1955 and was known as “Shotzi” in the music world, was music director of NBC and persuaded Toscanini to lead the NBC Symphony Orchestra in the days when high culture was a part of commercial radio and television network fare. As founder of the NBC Opera Company, Chotzinoff commissioned Gian Carlo Menotti to write television’s first opera, the now-famous “Amahl and the Night Visitors.” Menotti and Toscanini often visited Chotzinoff’s Ridgefield home. Born in Czarist Russia around 1889, Samuel Chotzinoff (pronounced “SHOTzinoff) began studying piano when he was 10 years old. He came to America when he was 17, attended City College of New York, and continued piano studies. At 20, he was “ghosting” as piano player when his big break came. The Times tells it this way: “He was playing a behind-the-scenes piano in a play called ‘Concert,’ while on stage the actor Leo Dietrichstein ran his fingers gracefully over a dummy piano. The scene had been rehearsed so minutely that the audience and the critics thought the actor was really giving a brilliant recital. Violinist Efrem Zimbalist Sr., who was to become a noted conductor (and father of Jr., the noted actor), heard about the incident, met with and hired Chotzinoff as his accompanist. Both were 21 at the time, and they toured widely together. Chotzinoff subsequently became accompanist for another famous violinist, Jascha Heifetz, and wound up marrying Heifetz’s sister, Pauline, in 1925. In the 1930s, Chotzinoff also taught at the Curtis Institute of Music. In 1936, David Sarnoff, head of RCA, asked him to visit the semi-retired Toscanini in Italy to persuade the maestro to take over the NBC Symphony Orchestra. “Many persons considered Mr. Chotzinoff’s task about as hopeless as persuading Toscanini to play a jazz trombone,” The Times said. “But Mr. Chotzinoff did it.” And the two became fast friends. Chotzinoff served as a music consult to NBC during the 30s and early 40s, and became music director in 1948. In 1951, he also became producer of NBC’s televised operas. He also founded the Chatham Square Music School, which in 1960 merged with the Mannes College of Music, now part of The New School. His daughter Anne Chotzinoff (1930-2002) married conductor Herbert Grossman. She wrote several books and translated many operas and lieder. Her daughter, Lisa Grossman Thomas, is a musician and writer. Chotzinoff died in 1964 at the age of 74. Known for his sense of humor, Samuel Chotzinoff loved a good practical joke. He once hosted a party for Toscanini at which a woman, who was one of his wife’s relatives, dressed as a waitress and donned a blonde wig. “When she came in to serve coffee, she astounded the maestro by sitting on his lap,” The Times reported.